We recently discovered Hamerton Zoo Park is on our doorstep and were pleased to be invited for a day out there so we could see for ourselves what it was like. We found it easily met up with our friends before heading in. Even though the car park was really busy it quickly felt quite peaceful and quiet once we got through the gate and although there were plenty of other people there it didn’t feel at all crowded like lots of places do in the school holidays. I really liked the set up of the zoo. There were lots of animals I had never even heard of before as well as some that I had that were very rare. I really liked the white tigers, they were awesome and I had only ever seen one before in a zoo in France. Taking a break from the admiring visitors! I especially liked Hamerton Zoo because it felt more like a conservation place than a zoo. The animals all had nice big enclosures and plenty of things to keep them busy- some had long tunnels and runs going off their enclosures too. There was a lot of information about the animals and their habitats as well as explaining how their population was in different parts of the world, this was really interesting to read and some of it was quite shocking. My very favourite animal was the white tiger but I also loved the chipmunks who were great fun to watch, the monkeys and meerkats who are really entertaining, the kookaburra who made a brilliant noise and the tortoises who are actually surprisingly fast and have an enormous enclosure that they race around. Actually I am sure there are lots more animals that are on my favourites list! Along with the enclosures and information we were also very impressed with how the zoo managed to blend with the environment generally. We saw two nests with baby swallows in and my friend’s Mum, who loves all things to do with nature and wildlife pointed out that there was lots of plants like buddleia that were good for bees and butterflies and plenty of bamboo and other plants too so it was good to see that Hamerton are supporting all the other wildlife too. Tiny baby swallows in their nest. One of our tests as to if somewhere is a good family day out is whether or not it has something that keeps us all happy and Hamerton Zoo seemed able to do that. My brother, Sam is two and liked being able to see the animals himself through the little windows in the side of the enclosures- he also absolutely loved the train. My Mum felt this was a little pricey at £2 per person (although she is judging this for our family of 5 which can make things seem expensive) but she said it wasn’t too awful because it was a longer ride than we expected and you got to see quite a few animals on route. Lottie and I also loved all the animals, I especially liked having all the information to read but also we both really enjoyed the play area too, this had a great selection of play equipment, with a huge climbing frame and a zip wire. There was a smaller play area for under fives too which had much better things than a lot of areas aimed at small children and kept Sam entertained for a fairly long time. There is also a stone maze within the play area which we all had fun walking on. There is a café which served a selection of snacks and things like hot dogs and sausage rolls as well as lots of benches that you could use if you had taken a picnic so it had a good set up for having a long visit. We spent most of the day at Hamerton, it was a great place to visit, we loved the fact that there was plenty to do but also liked the fact it wasn’t so big you couldn’t go back round and see things again. My Mum felt that although a zoo visit is always quite an expensive day out Hamerton Zoo was good value for money at £13.99 for adults and £8.99 for children with under 3’s going free- we will definitely be going back again and have already suggested it to lots of our friends for the Summer holidays. Disclaimer: We were lucky enough to be given free entry to the zoo in return for our honest review and all thoughts and comments are our own. We are lucky to have some great walks on our doorstep and Salcey Forest is one of the nicest place to spend an afternoon. Until 30th October 2017 you can go on a Gruffalo trail there, we popped over the other week and decided to see what it was all about. My little brother LOVES the Gruffalo and we all know the story off by heart having heard it since we were tiny. To take part you either just download the app and get going or you can buy an activity pack for £3- this was quite good because it had some fact cards with information in about animals and activities of things you can find in the woods, some things to spot and some stickers and some drawing things so we got one of these to share. We weren’t sure what you would have to do but it soon became quite obvious. The younger children would peek through binocular cut outs and spy a picture of the creature they were looking for and then you used the app to register the image and all of a sudden it would appear through the phone as it if it was actually there. We also worked out that you could take a picture as if you were next to them which was quite good. We had fun running through the woods and splashing in the puddles and found all the creatures before arriving at the Gruffalo. At some point we did have a few issues because the mobile signal wasn’t great- we never did manage to get the snake but that didn’t matter too much and Lottie and Sam had lots of fun spotting all the other animals- the Gruffalo was enormous. This is a nice way for children under 6 to spend an afternoon and quite fun for older kids to help with. We then went and had a huge piece of cake, two pieces between five of us was more than enough! Once we were all full again we headed off to the tree top trail which is amazing- you can see a really long way across the forest. If you are in the Northamptonshire area then it is well worth a visit. It costs £1.50 to park for an hour or £4 for the whole day and there are lots of picnic benches as well as a café. We have been invited to go on an adventure tomorrow and I can’t wait… I don’t think I will be able to sleep tonight! We are joining some other bloggers on a day out at Camp Wilderness and it looks amazing. The people at Camp Wilderness run Summer camps, school trips and all sorts of fun things but they are also having some open days for families to enjoy outdoor adventures and learn more about bush-craft. My sister and I have been looking at the itinerary all week and we can’t decide what we are most looking forward to- she is very excited to make campfires, I can’t wait to do everything! We are going to be doing exercises with camouflage, learning how to make fires and cooking on them, learning about trapping and doing camp crafts- it all looks awesome. My Mum says she is looking forward to toasting marshmallows! I have just finished getting ready to go and have got my walking boots, raincoat and water bottle so I think I am set- just got to try and get some sleep now ready to leave early in the morning! We recently took part in the RSPB’s Big Garden Bird Watch and while looking on there website we found some instructions for building your own nesting box. My Mum and Dad had given me my own toolbox for my birthday and I thought this looked like a good project to attempt to start with. We printed off the instructions and went to the shop to buy the parts and then I measured up the wood and got going. My Dad cut the wood for me and drilled the hole but otherwise I was able to do most of it myself with just some supervision. We added some roofing felt to the roof as we thought it would make it better but this was the only change we made as the instructions were really easy to follow. We also attached a hook to the bottom to allow us to add a bird feeder. I was really pleased with it and gave it to my Grandad for a birthday present. He said it was the best present he had! I am now going to make a nesting box for our garden and my Mum’s friend has asked me to make her one so I am going to be very busy! I think I might use woodstain on the next one but you don’t have to do that if you use the right type of wood. We live in a tiny village in the middle of the countryside and I go to school in a slightly bigger village ten minutes up the road. Our village has no shop and nothing much to do and we sometimes wish we didn’t have to use the car every time we want to do something but there are lots of other things I love about living here. Mum says this will change as I get older so we thought it would nice to be able to look back and see that there were great things about being here at the age of 7! 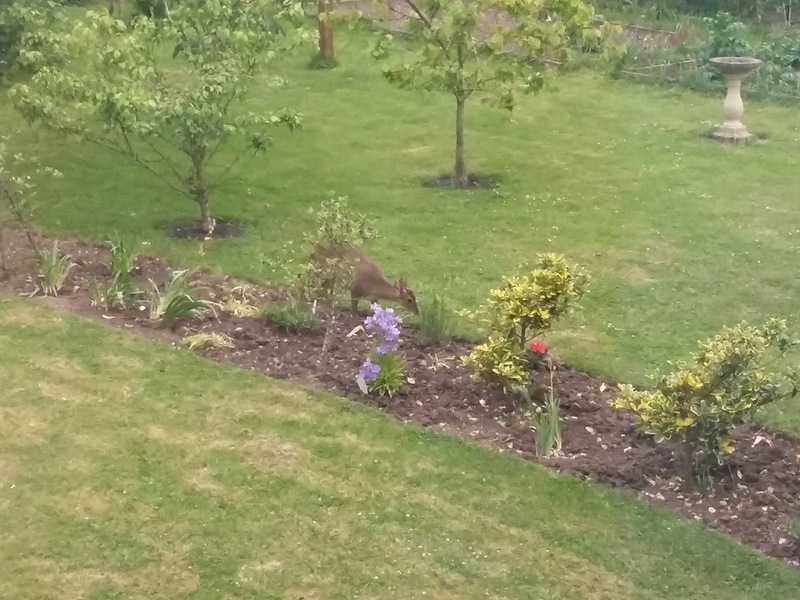 I know you can find nature everywhere but it really is right on our doorstep- we were closing the curtains the other night and saw a little deer nibbling at the neighbours plants, it was such a lovely, surprising sight we couldn’t bring ourselves to shoo it away from the plants. We also get lots of birds of prey around- especially this time of year when they are plowing the fields. We have a little robin who visits every year and we have two hedgehogs that come into our garden- they make loads of noise! At this time of year we get to see loads of really unusual farm vehicles along with the normal tractors (even if we sometimes get stuck behind them) and it it is really interesting to see them at work. We aren’t very good at growing things (expect rhubarb which takes over our garden) but have lots of friends and family who are- we have been given pears by my friend, apples from our neighbour and my Granny and then have been blackberry picking too so we have been baking lots of delicious cakes and crumbles- yummmm! We get a great view here of the sky at night and in the middle of the night the other week when I woke up I got a great view of the Super Moon. I really like getting my telescope out and having a good look and have been able to see the moon really closely and spot some of the planets. Lottie has decided she would like to ask for a telescope for herself for Christmas but wants it to be pink!! I love getting my walking boots on and dragging Dad out for a long walk through the woods and across the fields- we collect leaves, sticks and have lots of fun running through the fields and jumping in the puddles. It is awesome when we get snow here, it takes forever to melt as not many cars use the road so when the snow turns to ice it lasts for ages and because it is quite quiet we have lots of fun sledging before getting started on the snowmen and snow angels! Oh and it’s not too awful when we get snowed in and can’t get to school for a day! As you can imagine I am hoping for snow this year, we haven’t really had a lot since Lottie was a baby so she has never really had the chance to play in it properly and I can’t wait!